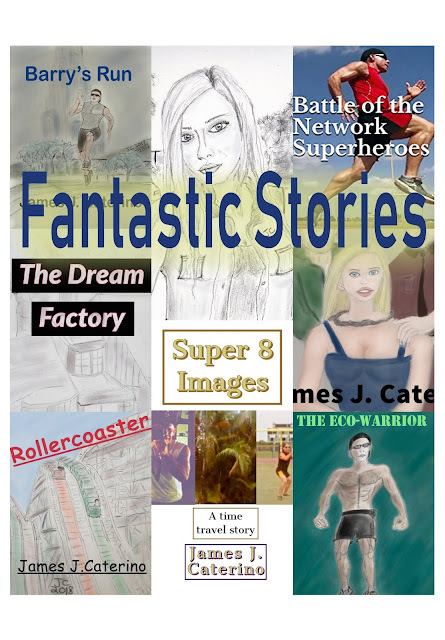 I have a new book out, “Fantastic Stories”. This is the anthology I have been dreaming about all my life; eight rip-roaring tales of epic imagination that pack a physical punch and an emotional wallop. If you like stuff like “The Twilight Zone”, “The Outer Limits”, “Amazing Stories” and “Black Mirror”, then you will love “Fantastic Stories”. Now available on Amazon Kindle and in Paperback. A girl from the year 2080 travels back in time to the present to save us from ourselves in the mind-blowing epic “Super 8 Images: A Time Travel Story”. An illustrator at an ad agency creates a drawing of a woman taking a selfie for a smart phone ad campaign. Then he comes across a real-life, living version of the exact same woman in “The Selfie”, a romantic science fiction thriller. Sixteen year-old babysitter Gina Zeneski takes the kids for a day at the amusement park and gets more than she bargained for in “The Rollercoaster”, a pulse-pounding story of harrowing action. A weekend road trip turns into a chamber of horrors for four college students in “The Rally”, a relentless tale of terror and suspense. Read these page-turning tales of imagination and more in “Fantastic Stories”, a collection of science fiction, action-adventure, and suspense stories, in the tradition of anthology shows such as “The Twilight Zone”, “The Outer Limits”, “Amazing Stories”, and “Black Mirror”.